With the market awash with a never-ending range of products, choosing the perfect garage door for a property can be overwhelming. In addition, in recent years, garages have evolved from a place to park a vehicle to an ‘extra space’ for the family, with many now used as areas for storage, work or exercise. Together with this change of use, has been the transformation of garage doors themselves. Originally constructed from wood, today’s garage doors are widely available in a vast array of materials such as aluminium, fibreglass, steel and composite. Further considerations such as colour, insulation requirements and specification - such as a roller door - can also add confusion to the mix. Gary Brooks, Managing Director of AlluGuard Roller Garage Doors, and Chairman of DHF’s Garage Door Group, has worked in the sector for more than thirty years, during which the industry has gone through tremendous change. “Thirty years ago, 98% of garage doors were the traditional ‘up and over’ model. We have transitioned from these, to sectional garage doors and roller doors. Market change is owing to a number of factors, namely, that land is now at a premium and consumers have shorter driveways and restricted space, making the ‘up and over’ style of garage door a more limiting choice. “Trends have changed over time and automation has also played a huge part in that,” he continues. “In the 1980s, an automated garage door was extremely expensive. Today, this choice is more affordable. 70% of domestic garage doors in the UK are now automated, compared to just 1% when I started out in the industry. "Over the years, the manufacturing of garage doors has become more geared towards health and safety, primarily for the benefit of the workers and end users. Plus, there is a greater importance placed on products that contain low U-values, as these are now highly sought after by consumers. "With such a significant shift in modern lifestyle as well, the products that are available today are so much more diverse and nearly always adapt to modern industry buildings and homes. These reasons combined mean that products are now manufactured with the environment, sustainability, and the safety of the end user in mind more than ever before." 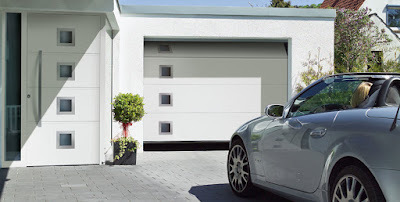 “Gone are the days when a garage door was simply a means to shut away the car,” explains DHF (Door & Hardware Federation) Commercial Manager, Patricia Sowsbery-Stevens. Tamworth-based trade association, DHF is a not-for-profit organisation for companies associated with Locks & Building Hardware; Doorsets; Industrial Doors & Shutters; Domestic Garage Doors and Automated Gates. Tracing its history back to 1897, it has more than 450 members and is the ‘go to’ place for technical advice and training, in a bid to raise standards across the industry. Central to those standards is a safe and compliant product, with DHF working tirelessly behind the scenes to eradicate non-compliant rogue traders to improve the quality and safety of garage doors on the market. “There are so many benefits to using a DHF member,” explains Patricia. “Each and every one of our members has the means to meet technical competence and is kept completely up-to-date with the latest legislation, especially the added legal requirements under the Construction Products Regulation and for automated garage doors, the Machinery Directive. They will also maintain public and employer liability insurance and comply with all appropriate health and safety regulations. “Most importantly, every member of the Garage Door Group will have undertaken the relevant DHF training course, which provides delegates with a greater understanding of legislation affecting the safe design, supply, installation, maintenance, and repair of domestic garage doors. At the end of the course, members will have increased knowledge of the safety standards and the documentation required for installation and CE marking.